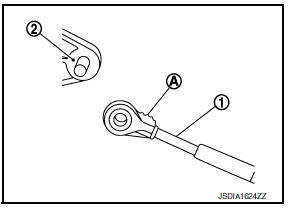 Remove shift selector knob with the following procedure. Slide the knob cover (1) down. Do not damage the knob cover. Pull out the lock pin (2). Pull the shift selector knob (3) and knob cover upwards to remove them. Remove the center console. Refer to IP-17, "Removal and Installation". Remove rear floor duct (LH/RH). Refer to VTL-8, "Exploded View". Move the shift selector to вЂњPвЂќ position. Remove the key interlock cable from the shift selector assembly. Refer to TM-260, "Removal and Installation". 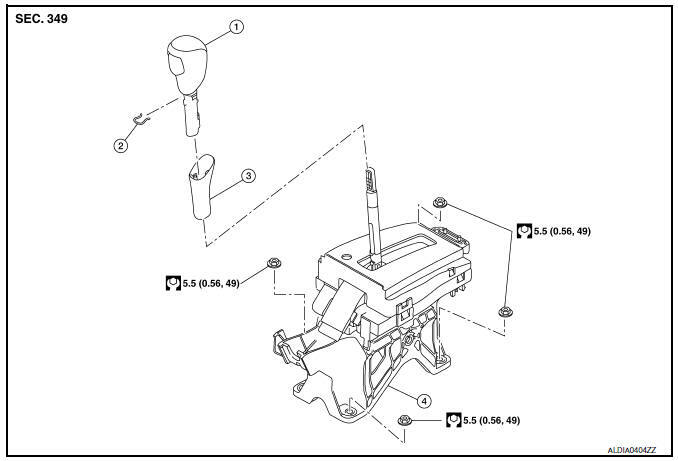 Remove the control cable from the shift selector assembly with the following procedure. 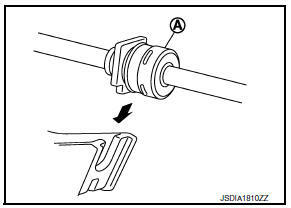 Disconnect the tip (A) of control cable from the shift selector assembly. Remove socket (B) from shift selector assembly. Remove harness clips from the shift selector with a clip remover. Remove the shift selector assembly from the vehicle. 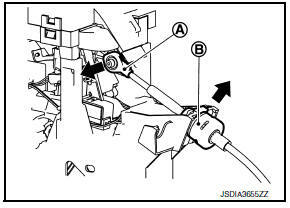 Pay attention to the following when connecting the control cable to the shift selector assembly. When connecting the control cable (1) to the shift selector assembly (2), face the grooved surface of the rib (A) up and insert the control cable until it stops. Install the socket (A) onto the shift selector assembly. Place the socket onto the shift selector assembly, then fasten it in place from above. Check that the pulling on the socket does not disconnect it. 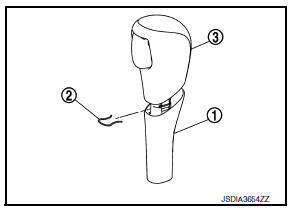 Follow the procedure below and place the shift selector knob onto the shift selector. 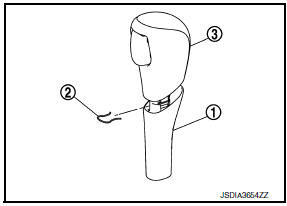 Install the lock pin (2) onto the shift selector knob (3). Move the shift selector to вЂњNвЂќ position. Insert the shift selector knob into the shift selector until a slight touch is felt. Press and hold the shift selector knob button and insert shift selector knob onto shift selector until it clicks. Do not strike the shift selector knob to press it into place. After installing shift selector knob, pull the knob to check that it does not become disconnected. Check the CVT position. If a malfunction is found, adjust the CVT position. Refer to TM-150, "Inspection".